Glenbarr is one of the villages in Kintyre that I've previously had little or no material to publish from. The main tourist attraction in the village is Glenbarr Abbey which is the centre for the clan MacAlister. However, recently I had an email from one Tom Johnston from Toronto in Canada who has traced his ancestors to the village; the following is his excellent account of his research and visit to the area. The article is titled Erin Roots - Erin is a small town outside of Toronto which was originally settled by a large number of Kintyre emmigrants. If you want to get in touch with Tom, his email address is - Tom.johnston@ctv.ca. I'll hopefully add some more general information about Glenbarr soon. Tom also has a couple of fantasy novels available for sale on the books page. This is a story about my Scottish roots... about a farmhouse on top of a hill in Kintyre, Scotland from which, on a clear day, you can see nine islands in the sea and the coast of Northern Ireland. Also, if you look hard enough and remember well enough, you can just catch the outline of new life and new hope across the sea in Erin, Ontario. This story is also about how I learned not to be embarrassed in pubs when my father shakes salt into his Guinness. Not that he drinks a lot. But I'd forgotten about the salt until a recent trip we took together to Scotland. It's an old Toronto beer hall habit he tells me. It doesn't really change the taste of the beer, it's just a habit. And judging from the puzzled looks on the faces of a long series of helpful Scottish barkeeps, it's a particularly Canadian habit. My father's name is Maurice Johnston. His father, Ronald Lorne Johnston, a third generation Erinite, was born and raised on a farm on Concession 8, Lot 16 in 1878. Ronald grew up learning to speak Gaelic, plant and plough with a horse, bale hay, make cider, smoke meat, hunt and fish, and all the other wonderful and necessary things pioneer kids had to learn to do in the Erin of the 19th century. In the end, farming became too boring, or perhaps too difficult, and Grandpa Ronald opted for the exciting world of high technology. He left the farm and became a telegrapher for the Canadian National Railway. My father grew up hearing second and sometimes third-hand information about his family's pioneer days in Erin. Grandpa Ronald (known as Tom for some unknown reason) died in Toronto when Dad was just four years old. Much of his history died with him. Dad doesn't even have a photo of his father. But after years of digging through census records and surfing the net, Dad and I have managed to glean a little information about his Erin family and we've met a number of interesting people, both living and dead, along the way. For example, there is a pair of graves in the Erin Pioneer cemetery that memorializes two very important people in my family. The stones read John McLean and Flora Milloy and they are at the end of a path that had its beginning in the hills of Kintyre, Argyllshire, Scotland. In 1831, John and Flora and their eight children left their tiny village of Glen Barr, Killean Kilchenzie parish. They sailed across the Atlantic and settled on a farm on Concession 9, Lot 21 in Erin. Now, I'm not really sure how many descendants of John and Flora are still living in the Erin area. I'm sure there are a few (they should call me), but during the last few years of researching my family tree I've come across several interesting descendants who have lived there and elsewhere over the years. One of their sons, Archibald Mclean, left Erin for the U.S. in the 1860s where he enlisted with the Union forces in the civil war. One of their grandsons, another Archibald McLean, was a rascal indulging in a bigamous relationship that was only discovered, by both of his widows, after his death. ( I should check out the Advocate's archives for that story). One of John and Flora's great-grandsons, William John McLean, went to the Berlin Olympics in 1936 as a judge. One of their great-granddaughters, Doris Kassowan, was a deputy sheriff in North Dakota in the 1940s. And one of their great-great-great-grandsons, perhaps the least interesting, is a television journalist and an amateur genealogist. Me. 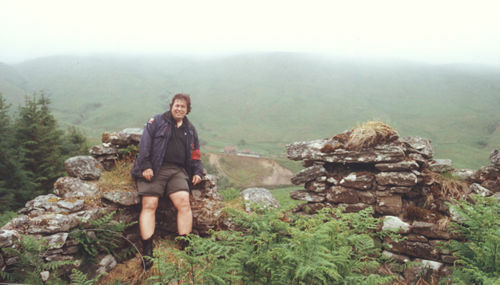 This last June, my 72-year-old father and I found ourselves hiking up the remote Glen Barr (read valley of the Barr Water) about 20 kilometres north of Campbeltown, on the west side of Scotland's Kintyre peninsula. It was a three-hour hike from the nearest house, to the remains of Stockadill croft. 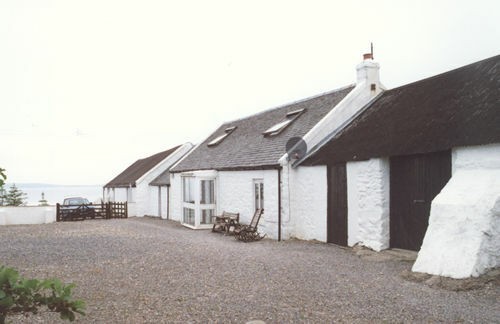 John McLean was born here in 1784, 47 years before he sailed across the sea to Erin. The walls of the old house now stand only shoulder high; the thatch roof is gone, but not the view. The house is perched on the side of a south facing hill. The walls are dry quartzite stone chipped and piled with some skill. They are about 18 inches thick. Standing inside what was once the bedroom window of the two-room ruined house, one can see through a constant rain across the Barr Water to the other side of the glen. The hills are dotted with some of the three thousand or so sheep that wander over the current farm. More than two hundred years ago, this broken house was a working, thriving family centre. When my John McLean was born, his family was in the midst of a life-changing transition from basic subsistence farming - vegetables grown inside a stone fenced plot, milk cows and brown trout from one of the three small deep locks behind the hill at the back of the house - to sheep herding. For a small rent, usually some mixture of limestone blocks, labour rendered, lumber, or woven cloth, John's family had lived well enough to survive and grow. But just after he was born the landlord, one Colonel Charles Campbell who sublet vast estates from the Duke of Argyll, changed the way rent was paid from the easily attainable commodities to cold hard cash. Charles wanted the tenants gone so he could raise sheep instead of just more tenants. This woolly economic axe was far more effective than the swords of King George the Third in quieting the rebellious north. Sheep were one of the more insidious ways in which the highlands were "cleared" of small farmers. Sheep were more profitable than extended families of tenants. It was harder for farmers to get silver pennies than two tons of quarried limestone, or a barrel of kippered fish. Ironically, John would live to see this same Charles Campbell bankrupted by high living. Glen Barr cuts almost halfway across the Kintyre peninsula. Only a few families still live there, all of them sheep farmers to one extent or another. My father and I stayed there in the glen's almost palatial "Arnicle House". It's a bed and breakfast, and restaurants for lunch and dinner are scarce in the area. Our host, Elma MacArthur, came to the rescue. "Why not try North Beack More. It's just a short distance away, small, but the food's fine." Dad and I climbed into the car and he navigated while I drove. This situation in and of itself requires both parties to possess the patience of saints. Especially me. The North Beack More restaurant is a neatly kept white-washed croft, the only building on a high windy hill. It has several additions built onto its original, 400-year-old, structure. A satellite dish is mounted on the stone wall, a testament not so much to modernism as to the lack of other t.v. reception. The restaurant is in what was once a barn but now converted into a simple, comfortable dining room that looks out on nine of the Isles of the Hebrides and, on a clear day, Northern Ireland. While Dad examined the menu, I saw the name of the restaurant at the top of the page. While the locals pronounced it "North Beack More" it was spelled "North Beachmore". That name triggered a memory. I excused myself and walked outside through the wind and back to the car for my family tree records. When I returned Dad was charming the owner and sprinkling a dash of salt into his Guinness. The somewhat puzzled woman was taking his order looking askance at the salt cellar. I showed her my files. "Yes, that's how we're spelled ,'North Beachmore'. It's a Gaelic name you see. Beach, pronounced as Beack means 'beast' and More means 'great' or 'big'. The name means 'Great Beast' - that's the wind you see. It never really stops blowing here." "My great-great-great-grandmother, Florence Milloy, was born here in this building in 1787", I replied, showing her my parish records. She was as delightfully surprised as I. Looking at a photocopy of an old map, we both noticed that the 'North Beachmore' croft was just a short five-mile walk over a hill, down into a glen and then up another hill to the ruins of Stockadill. It was just an hour's stroll, as the shepherd walks, from young Flora Milloy's home to young John McLean's. Their well-worn path is long grown over though. The owners insisted that Dad and I tour the renovated croft, "just so you can see we're taking care of the old place". They certainly are. I walked back out to the car and put my records away. A magnificent sunset was beginning. The great wind blew across the Atlantic from Newfoundland and smashed into my face. When I returned to the warmth and hospitality of what was once my great-great-great-great grandfather's barn, there were two pints of Guinness on the table and my dad was shaking salt into his. He and I talked about the wonder of coincidence, we talked about how hard life must have been for our ancestors here on the windy hills and about how both Flora Milloy and John McLean must have stood here gazing out across the Atlantic dreaming of their new home in Erin. We spoke too of us, about how much life had changed for him over the years, about how well he remembered his father even though he was only four when my grandfather died. Dad told me he still can't believe that I, his eldest son, am almost fifty, nearly the age his father was when he died. His eyes grew moist for a moment. There would be other discoveries on this trip. Other sites seen and other people met; family ties encountered and ancestral Castles toured. But on reflection I learned more about my father that evening than I did about all my forefathers and mothers during the entire trip. While I still can't quite bring myself to salt my ale, I don't mind so much now when my dad does. It's not a sacrilege, it's just an old habit.